What Day Of The Week Was November 24, 1965? 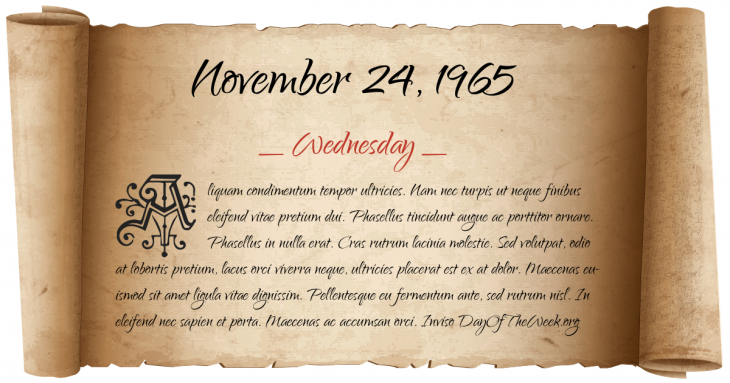 November 24, 1965 was the 328th day of the year 1965 in the Gregorian calendar. There were 37 days remaining until the end of the year. The day of the week was Wednesday. A person born on this day will be 53 years old today. If that same person saved a Half dollar every day starting at age 6, then by now that person has accumulated $8,660.00 today. Joseph Désiré Mobutu seizes power in the Congo and becomes President; he rules the country (which he renames Zaire in 1971) for over 30 years, until being overthrown by rebels in 1997.
Who were born on November 24, 1965?